Texas ex Brian Orakpo is tearing up the NFL in his first season with the Washington Redskins, already with 7 sacks midway through the year. The Washington Post gets some good quotes from Redskins coach Jim Zorn, Texas coach Oscar Giles, and former teammate Rashad Bobino about Rak’s transition to a hybrid defensive end/linebacker. 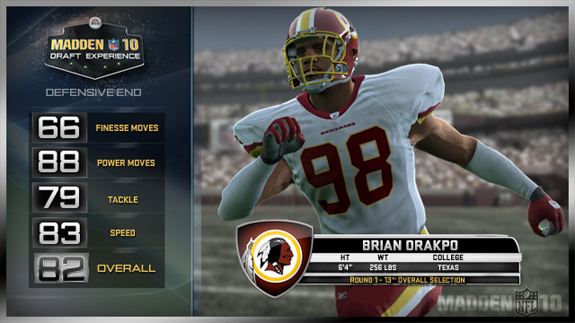 Brian Orakpo has agreed to a deal with the Washington Redskins. Terms of the deal to come later. Strengths: Chiseled athlete with explosive first step, he is the best pure pass rusher in the draft. Uses his hands to fight off blocks and tries to stripe the ball on every sack. Not great versus the run, but not a liability either. Tireless worker in the weight room. 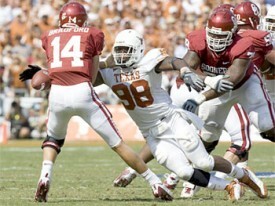 Absolutely destroyed OU’s Phil Loadholt when they played, who at the time was considered a first day pick. Weaknesses: Can get swallowed by bigger tackles, maybe he is too reliant on his speed rush? Has had knee injuries for the past two years, and he tends to play high which leaves him susceptible to re-injury. Originally weighed 215, Orakpo is now up to 263; so his frame may be maxed out. Will give up several inches to NFL tackles, which really hampers his leverage. Despite all his impressive measurables, could stand to gain some lower body strength so he can drive through blockers that engage him. Overall: Elite pass rushing talent, teams would be better served letting him be a speed rusher than trying to make him an OLB. The knee is troubling, but none of his injuries were really serious. Might get swallowed by tackles at the next level in the run game, but his burst will give him a chance to get to the QB. May not be Mario Williams, but could be Dwight Freeney. Two of my favorite things about Sports Illustrated growing up were the weekly “Sign of the Apocalypse” and “They Said It” bits in ever issue. They were a glimpse at the weird and interesting side of sports that we didn’t get to see much before we had access to the the ubiquitous freak show we call the Internet. The Browns’ [tag]Shaun Rogers[/tag] reportedly wants to be traded, in part because new coach Eric Mangini didn’t say hello to at the team’s practice facility in January. I’m sure more there’s more to the Rogers/Mangini story, judging by his quick and unceremonious exit from New York he definitely appears to be a tough person to like. You don’t have to be friends with your coaches or teammates, but someone small and petty enough to intentionally walk past you without saying high doesn’t exactly earn much respect.